'Lotus' is the theme for Saturday 16th June with three marque races, one of which is a 90 minute endurance, complete with pit stops and driver changes. Sunday is 'Anglo/Japanese race day, with hoards of Mazda MX5s enjoying several races, along with championship races for Toyota MR2s and various other rice rockets. Sprinkled throughout the weekend are the double headers for Castle Combe's home championships for saloons, single seaters and sports GT cars. Mostly local drivers fighting for Castle Combe championship honours face considerable pressure. Saltford's Steven Jensen who secured his first win of the year in the circuit's Formula Ford 1600 championship at the last event. Although Jensen has a nine point championship lead the three other race winning drivers are snapping at his heels and one tiny error could change the complexion of the standings completely. Opposition comes from fellow Kevin Mills Racing team mates. Roger Orgee, from Langport, in his Van Diemen, whilst on the other side of the garage lurks 3rd round victor Nathan Ward from Coventry, in a similar Spectrum chassis to Jensen. 18 points behind, but potentially the greatest threat, is Bratton's Ben Norton in the Wiltshire College Spectrum. With three fastest laps to his credit and the 2009 champion's season opening results not at all typical of his potential, the others will be hoping the rain the Spectrum hates might keep Ben at bay. Not to be forgotten are Yatton Keynell's Luke Cooper in the Swift SC10 and KMR's 4th A class driver, Chepstow's Nick Jones. In class B, 17 year old James Raven from Portsmouth is emerging as a new star, whilst David Cobbold has already clocked up a massive C class championship lead. 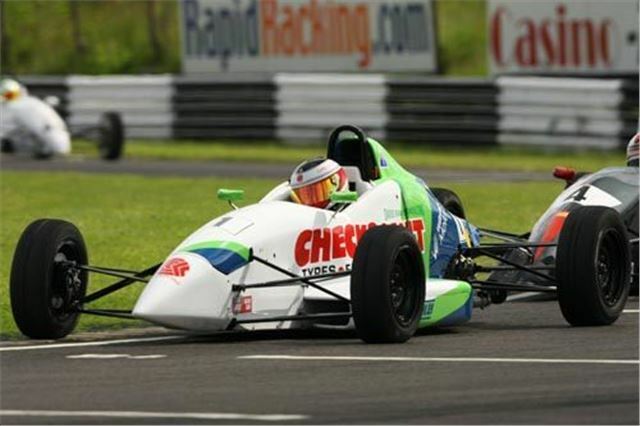 With four different winners from the first four races, Formula Ford at Castle Combe is closer and even more competitive than it's ever been, so spectators are in for a double treat this time. In the Castle Combe Saloons, Corsham's Will Di Claudio is gradually extending his championship lead, the class B Peugeot 106 driver easily able to win his class at the moment. His competition comes from his potential to run at the very front, making the up to 3 litre class A drivers his immediate threat and the under 1400cc class C a bone of contention for championship points. So far, Charles Hyde-Andrews-Bird from Ditcheat has had to share the baby class wins with Russell Akers, so hence lies 4 points adrift. But one small dose of unreliability could change things completely. The class A drivers make life more difficult for themselves meanwhile by sharing their class wins and points a little more evenly, with Calne's Tony Hutchings in the Audi TT and Southampton's Adam Prebble in the Rover Turbo on two apiece. Bridgwater's Tony Dolley is on form with his Peugeot 206, but still has Bristol's Mark Wyatt in the Astra, Mark Funnell from Trowbridge in the Mini and Melksham's Rob Ballard in the SEAT Leon to contend with. The fascinating story of the Vadabar Sports and GT championship at the last meeting was the return of Trowbridge's Andrew Shanley in his Radical Prosport. The interest lay in the fact the car had been sold and then bought back, Shanley immediately on the limit with it to win class B and take a fine second place behind the omnipotent Jade 3 of Tony Sinclair. Simon Tilling's class defeat by Shanley will make things more tricky in the points battle with Southampton's Gary Prebble in the Mitsubishi Evo, who is yet to be troubled by the BMW E63 M6 of Vadabar M.D. Doug Watson from Blagdon. The complex new machine should be amazing once sorted. Bath drivers Des Andrews and Guy Parr have their Megahart and Nemesis run by the Dursley based Wayne Poole Racing team. Josh Smith from Weston Super Mare is the lone 'Invitation' class driver in his Radical PR6. Simon Jones from Oldbury on Severn is one of a number of drivers with a very busy Saturday. As well as a pair of 20 minute races for the Lotus Elise Trophy race, many of the Lotus drivers will also contend the 90 minute Lotus Cup UK race, some of which will be broadcast on Motors TV. It's difficult to comprehend the number of drivers in the various Mazda MX5 races, which provided first class entertainment upon their visit last year. The Toyota MR2s are almost as prolific, whilst the Nippon challenge provides more diversity with Subaru, Honda, Suzuki and Nissan supplemented by other Asian makes such as Hyundai and Daihatsu. Saturday's action starts with qualifying at 08:30. Racing gets under way from 12.35. Sunday gets under way with qualifying at 08-35, with the first race at 10.20. Admission prices are on Saturday, £10 for Adults, £5.00 for OAPs, Paddock Transfer free and on Sunday, £15 for Adults, £7.50 for OAPs, £2-50 for Paddock Transfer, whilst accompanied children under 16 are admitted free on both days.